Kirby Crackle is peculiar visual effect created by Jack Kirby. It’s distinguishing feature is that it’s made up of clusters of Black blobs. Built up over white these create a cool looking visual effect of power. (See the Jack Kirby drawn example below). Many artists have since latched onto the Kirby Crackle (as it became known) and used it for their own work, so much so that it’s now common element of comic book design. Anyhue, Manga Studio allows you to create your own brushes, and I thought it’d be fun to come up with some Kirby Crackle. Step 1: Create a new document, with a nice clean layer. Draw a LARGE circle (about a quarter the size of the page) on this layer – using the Ellipse tool (press U) and draw the ellipse will holding shift will ensure it stays circular. This is our template circle. Step 2: Create a new layer on top of this layer, this is where we’ll draw our Kirby Crackle. Draw a number of Circles WITHIN the larger circle. You can draw any number you like – make sure every circle has a little space around it. 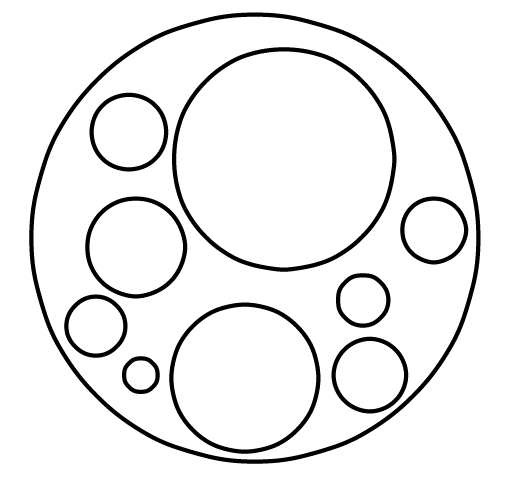 Step 3: Fill in black within the small circles – using the FILL tool. Step 4: Draw a Marquee around the small circles (don’t worry about covering the big circle – you can hide this layer if you like). Step 7 – tweak the brush controls, I find that best results are from setting the size to alter on pen pressure, setting the interval to something where each krackle element is just touching the next (this depends on the size you’ve drawn the circles – but on my circles it’s set to 70%) and set the Brush SHAPE direction to RANDOM.